An open letter to Bank of India : Are you bothered about your users? Bank of India has launched its yet another terribly ‘faltoo’ service. This time its a software! There are no more browser based services available after March 18th 2010. I am not surprised but rather annoyed at the foolishness these people carryout sometimes always. 1. It works only on Windows. I gave up windows due to virus & security reasons. I am now on Macintosh. I can’t use any of Bank Of India’s online services. So its a waste for me. There are 20% people like me who are using non-windows operating system. 2. There is not much information about the digital security. The first time I use star token it asks for a PIN. How can I confirm that the information is going out securely from my system? It is not mentioned anywhere on the website. When we install it says Publisher is Uniken Systems Pvt. Ltd. : Who is this Uniken Systems? How many of you know these guys? How does a lay man know about it? Should Bank of India website give some instructions for this? Its ok to have a vendor do certification for you. But where is the information passed to the users ? 3. The first time Bank of India has mailed a secret PIN number to all their customers. (note the huge postal cost). What If I format my windows? 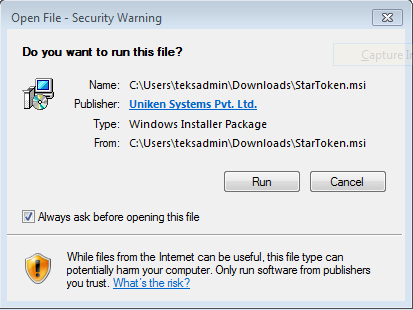 I have to re-install the Star Token which will demand an authentication PIN which is mailed to me via post. It appears that this pin is usable only once! I am stuck! Help me! 4. Not sure if Bank of India thinks long term or not. According to a news, Microsoft windows will be shipped with an option of NOT having Internet Explorer. How will you guys deal with this? The software is heavily dependent on embedded Internet explorer control(Not just heavily, but rather say fully dependent!) which internally connects to BOI website! I am sure the software was heavily invested product. An unplanned investment. Any Answers BOI? 5. The software’s usability is very annoying. It blocks the entire screen. This means I can use only and only one program at a time. I am not sure if it has been tested with other intrusion detection / anti virus programs. Technically speaking, when the program requests for a full screen hook blocking other program, its a virus like activity for many anti-virus programs unless you add a exception to it. Have you tested it BOI? 6. The whole idea of Internet Banking is ruined. This particular software restricts me to use the services from ONLY and ONLY 1) Windows AND 2) Internet Explorer AND 3) Only single Application at a time as it disallows me to use any other program at other time. I am not sure how this will work with ONLINE payment gateways! 7. According to a news report, French and German government has officially asked everyone *NOT* to use Internet explorer. Indian govt systems were compromised due to usage of Internet Explorer. Time and again it has been proved that Internet Explorer has been more vulnerable towards attack than any other browser/system. Why so much dependency on a single browser and racism towards other browsers? Isn’t Bank of India technically capable of providing services to another operating system? 8. Most of the Internet explorers in *India* are A) IE 6.0 and IE 7.0. Out of them 90% are default with their operating system which are *NEVER* patched to the current security level which Microsoft has to offer. There is always a threat of hackers using existing loopholes in the system. With this step Bank Of India may publicize that it has added an extra level of security with all these hassles and restrictions, I rather use my old banking way of depositing a cheque/ draft than using such system. Or may be just close an account with them. They don’t care a damn for a single person! Do you BOI? Security doesn’t mean you will narrow down options for users. It rather means you have to narrow down Hacker’s options and attempts to break into the system. And yes, its not the end of the world. There are other banks which provide higher and secured system without A) annoying the user or B) Restricting the user for a particular operating system which has time and again proved to be more vulnerable than other operating systems. Any comments on this one, BOI? Why does Bank of India invest in padding up existing technology and not open to newer options and not giving a though that ultimately the service is going to be used by end users! If you be evil to the the end users and they aren’t happy, it will be inevitable that sooner or later they will close an account with you.. ! Bank of India, I am not going to close the account with you immediately(But with such ‘funny’ services, I will soon). But yes, Its my humble appeal, Please employ better brains to put up a better security system which is easy and user friendly. This entry was posted in All Blog Category, internet, me, Technologies & Products on March 3, 2010 by Hussain Fakhruddin.